Mr. Bevan Gore-Langton and his Fabrique Nationale de Herstal bike. I love history and I particularly love hearing stories. I have learned over the years that every human has a story, whether it be mundane or magnificent. I remember when I was little sitting and listening to my parents and grandparents tell stories. I loved stories about when my parents were kids, but I particularly loved hearing the tales of my grandparents, the things that they saw in their lifetime was amazing, from horse and buggy to early automobiles to current day tech. Anyway I digress, onto the tale that started 80 years ago during World War 2. This is where Bev Gore-Langton comes in. 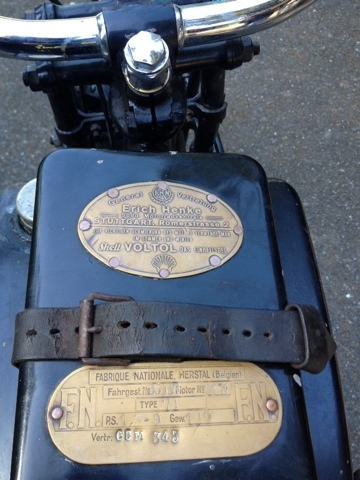 This brings us to the this other moto lovely the Belgian made Fabrique Nationale with its echoes from the past filling the present. 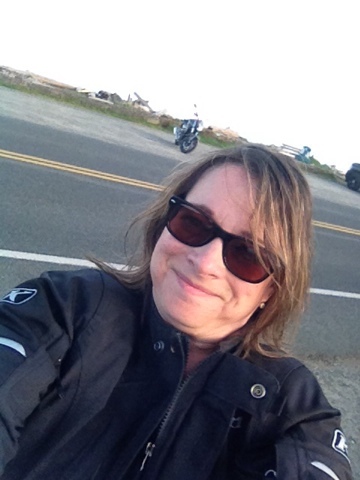 Bev tells the most incredible story of fear, courage, defiance, and fate, all forces that when combined together preserved this beautiful piece of motorcycle history, while still bringing home the message that we need to remember and learn lessons from the past. The story begins in war torn Europe in Hamburg with the city being occupied by Nazis who expropriated everything 2 & 4 wheeled. 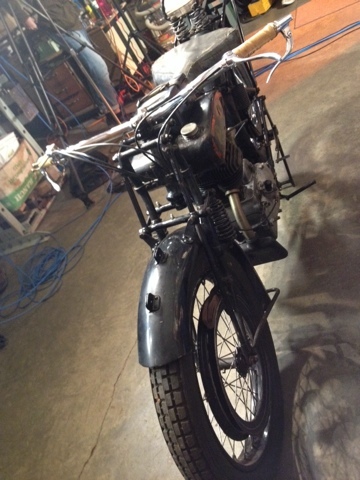 It was this bike that started a quiet courageous defiant filled rebellion of one man determined to keep his motorcycle. An act so courageous that he risked his life for the love of a motorbike. 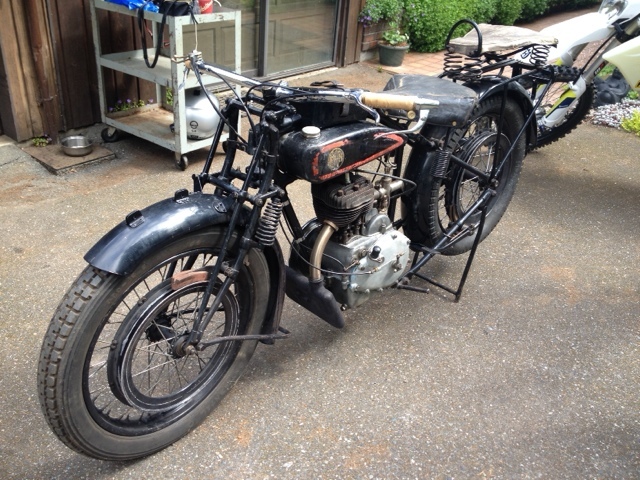 In 1936 the owner was asked by the occupying forces where his bike was, he replied that it had been stolen. The Nazis told him they were going to search his home and property and kill him if they found out he was lying and anyone who helped him would suffer the same fate. This was at a very dark time in human history. People were finding ways to defy the madness and to this man it meant taking his bike apart piece by piece and then secreting those pieces throughout the city in hiding places provided by friends. This was remarkable because anyone who defied the Nazis generally did not survive to tell the tale. When they searched his home and those of his friends they found nothing, others had attempted to do this, but unfortunately were not successful and suffered for their actions. 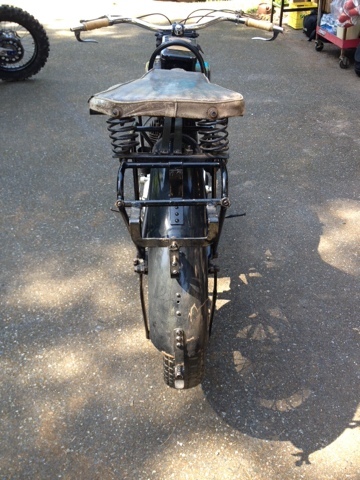 Fate had a different plan for this bike, it was meant to survive and be a testament to human spirit, unending hope, and eventually come to the storyteller Bevan Gore-Langton. 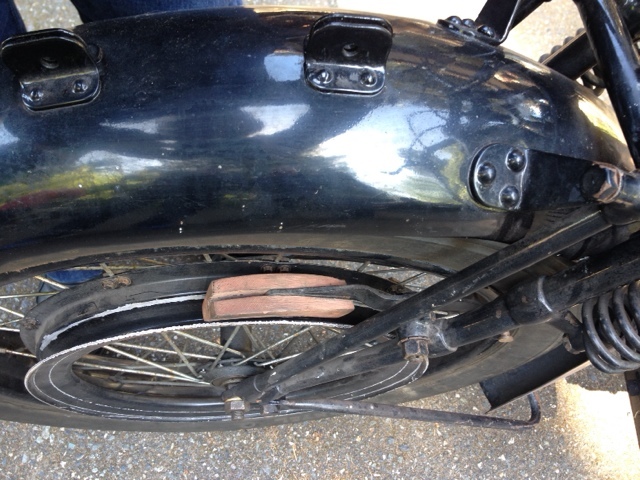 The bike laid hidden from 1936 until the wars end in 1945. The defiant owner survived his ordeal and collected the pieces, but this was not an easy task. Europe went through devastating physical tumult in an ever changing landscape, with the owner not knowing if all the pieces could be reclaimed. Eventually all but two of the parts were retrieved. 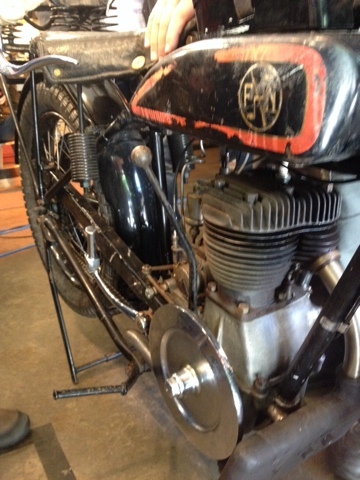 Incredibly the wrenches in the tool box are original to the bike. 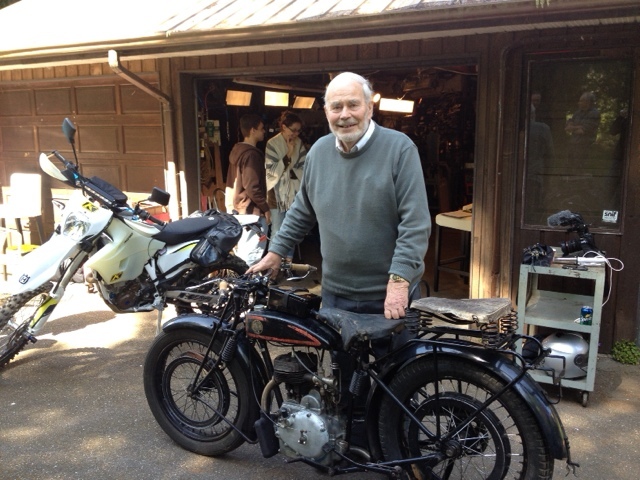 The bike was restored and made a journey to Canada with the man and his family. Fast forward to recent times and the bike finds Bevan at a classic bike show, where it caught his eye. He struck up a conversation with the current owner who then told this incredible story resonating with the echoes of time gone by, but not forgotten. A question was asked "Is it for sale?" 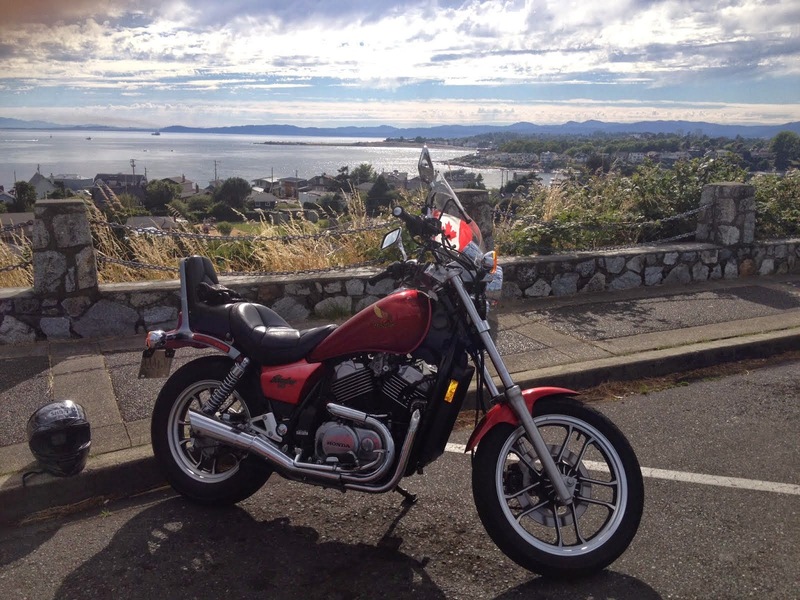 Surprisingly it was and Bev brought it home, where it would be cared for and even ridden, but most importantly the story would be told and shared with a group of people sitting around the bike in a garage - Farkle Garage. This amazing story will air in Episode 6 in May. I will post the date & link. It truly is an incredible story. 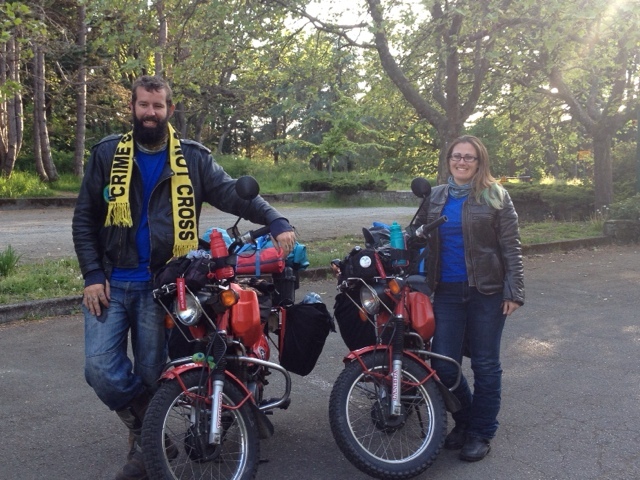 Wednesday night I met Todd and Chantelle Powell who have travelled from Australia to BC for a grand adventure. 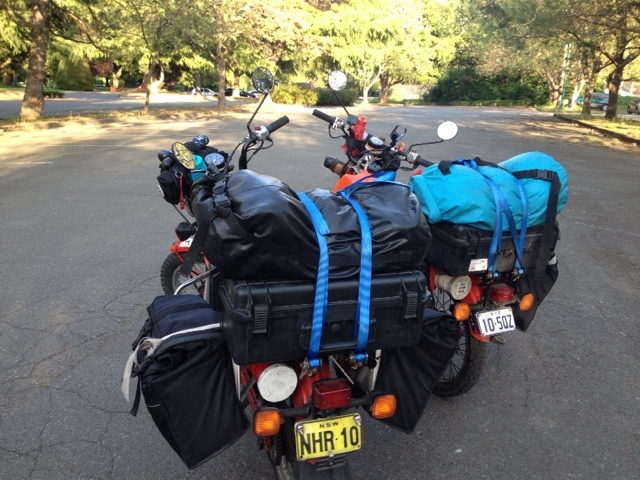 They are on an EPIC five-year road trip on Honda CT110 Australian Postie Bikes, affectionately known as Mabel and Rosie. 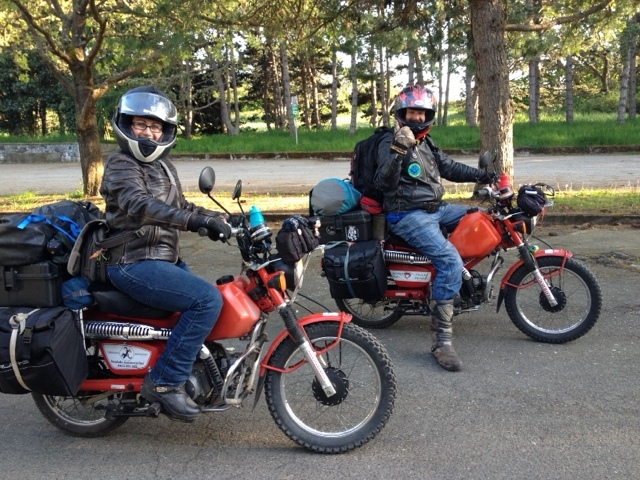 They shipped their bikes to BC to start their adventure and were originally going to head up to Alaska, but after emailing them and letting them know we are still in the tailend of winter in the Northern parts of the Province they decided to ride around Vancouver Island. 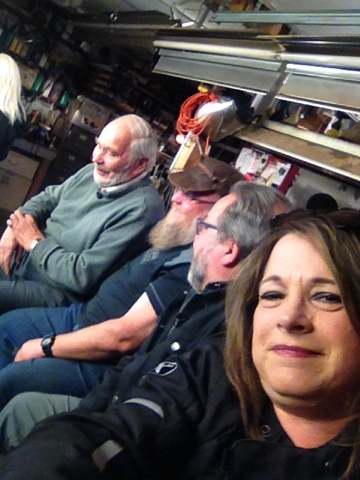 I was lucky enough to catch up with them to interview them for Farkle Garage. Todd and Chantelle hatched this plan back in about 2008 after honeymooning in BC. Their love of small cc bikes grew from a tour of Vietnam they did on 125cc scooters. When asked if they would rather do this on a larger cc bike they emphatically said "No" Todd replied "When I travelled on a big bike, I was just another guy travelling on a big bike." The Postie Bikes draw people to them because they are curious about this not often seen bike in Canada. Travelling on a smaller bike has its challenges for such a big journey with lots of high speed roads, hills, and mountains, it just requires a lot of meticulous route planning as they stick to slower speed roads, because they travel slower on their 125cc bikes and it takes them longer to get to places. This type of touring allows them to go through little towns, take their time to explore and meet people, and that's the romance of an adventure like this. They do stop to smell the proverbial roses and savor the moments. 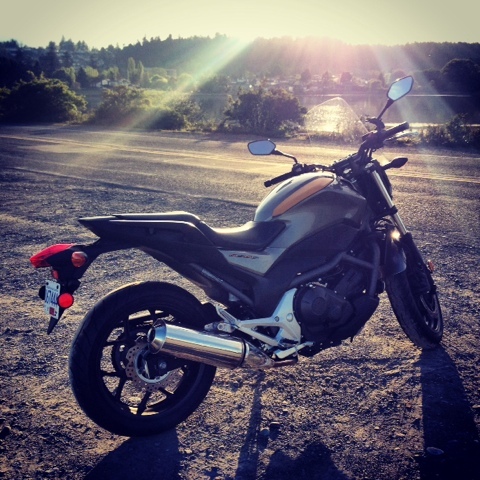 Big dreams and big adventures can happen on small engine displacement bikes. 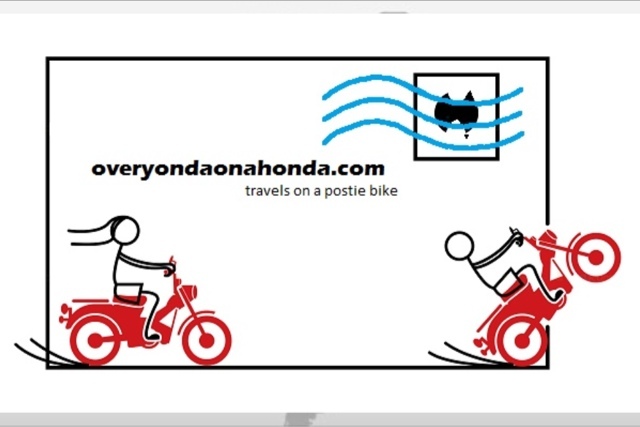 The bikes are Aussie Postie bikes which are the workhorses of the Aussie postal system. They have been modified with bigger tanks and get about a 500km range with average speed about 75km/h. 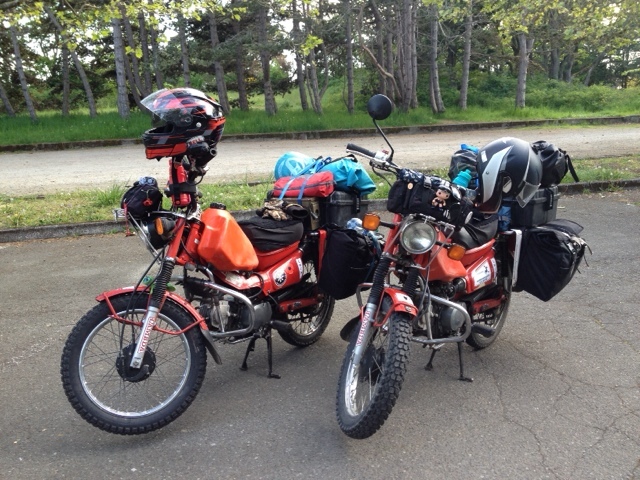 The stock Honda engines have been upgraded to 125cc Lifan engines to give Rosie and Mabel the extra oomph for tackling the mountains. 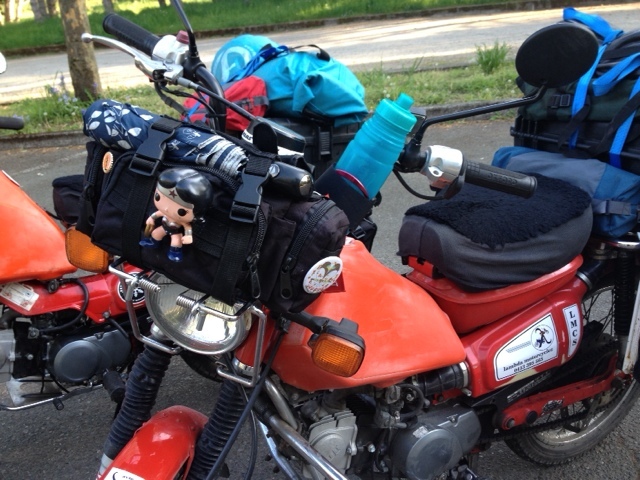 The bikes are well packed with side and back bags, the secret for this trip is packing light, that meant laying belongings out and then culling down to bare basics & about to two sets of clothes. They will be winding their way through the wilds of BC heading up to Alaska, after that they're going to make their way through North America and other countries wirh the final stop home in Australia. When asked what their favourite Farkles were, it was their heated grips which have been particularly handy in the chilly spring weather. 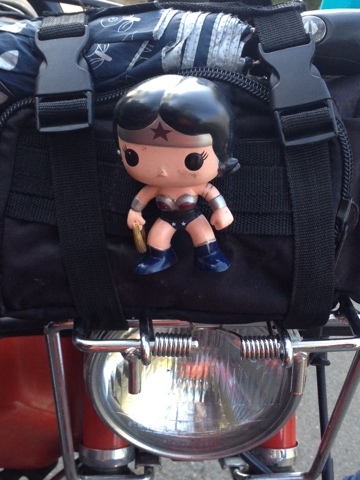 Chantelle also has her Wonder Woman mascot, which I think is pretty badass! Wonder Woman going for a tootle on Rosie! 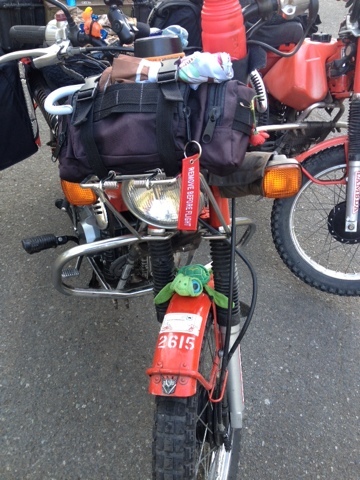 Todd's sidekick is Squirt, who has been on many a trip on his other bikes. 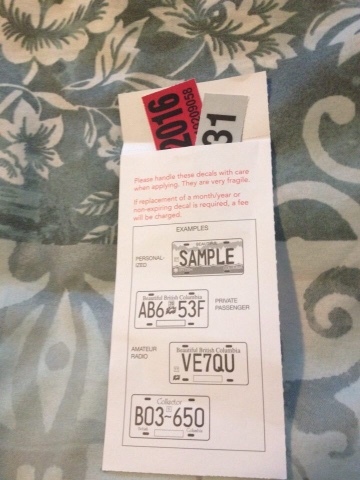 Notice Mabel's tat 2615, they jokingly call it her convict number. 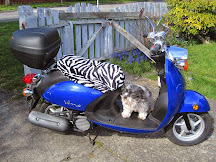 Todd's bike Mabel maybe little, but she is packed with attitude and she has been a persnickety little moto tart and had to have a visit at local motorcycle shop for a little bit of moto intervention, she's all tickety boo and ready to ride. 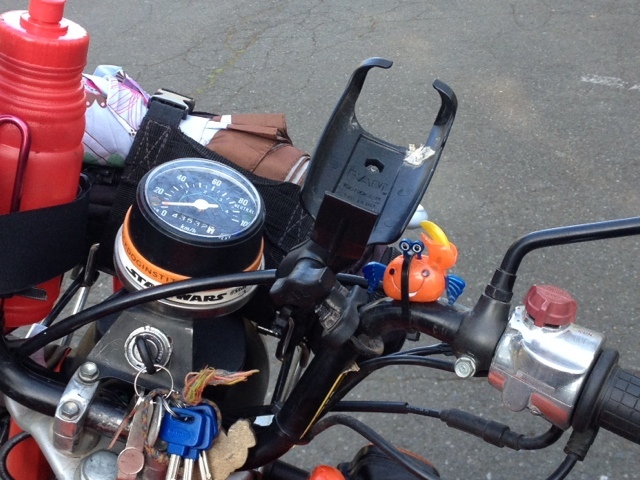 A few other Farkles include a GPS, a front rack that carries a ditty bag with an umbrella on top. Chantelle's trusty steed is the ever plucky Rosie who is the heartier gentler soul. When asked what they were most concerned about on their trip through the wilds of BC it was bears when camping! They have read up on bear precautions and have bear spray at the ready. Just don't take cookies into the tent! 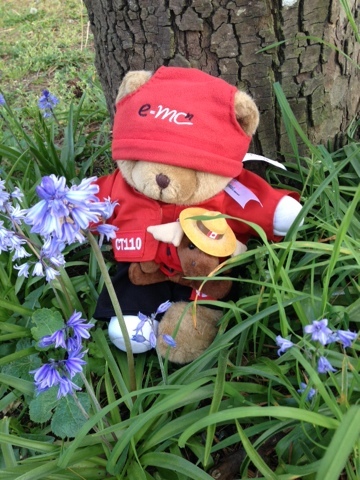 Speaking of bears meet their little stowaway Miss Scarlet who is a bandaged bear. This little bear will be with them on their travels for the next six months and will be returned to Australia where a storybook will be created about her adventure and she will be given to a sick child. 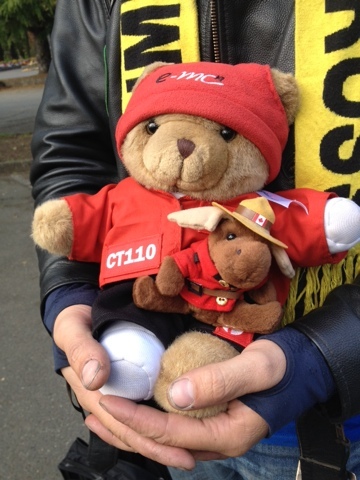 Scarlet has already picked up a Canadian buddy Mountie Moose. Bear and Moose on the loose! When asked what they liked most about BC they said it was the people and how kind we are and they discovered a love of Tim Horton's! 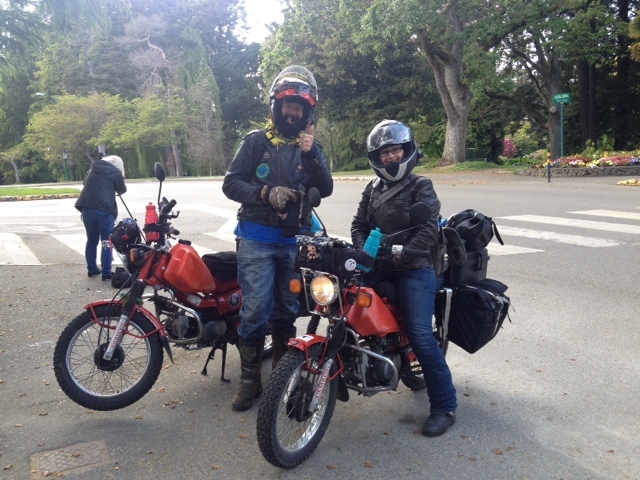 Our visit was drawing to a close and I have to say "You meet the nicest people on a Honda from Over Yonda!" 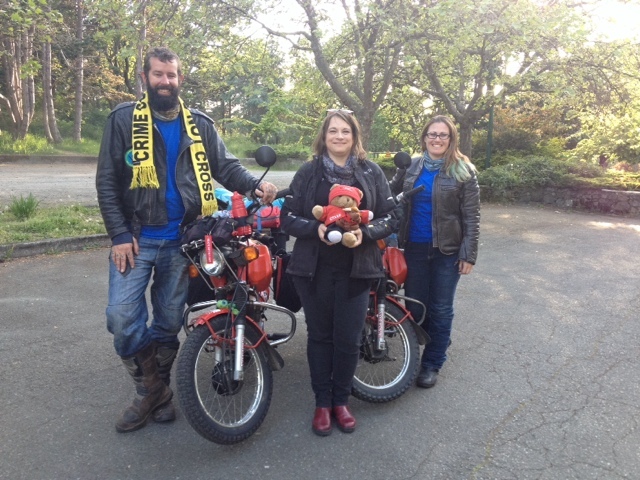 You can follow their journey on their blog Over Yonda On A Honda or on their Facebook page - Over Yonda On A Honda - give their page a like and follow this intrepid adventure. Godspeed my friends, may your days be sunny and wind at your back! Motobloggers are a very cool unique group of people. When I started blogging in 2011 I had no idea it would lead me to meeting some very incredible people whom I am proud to call friend. 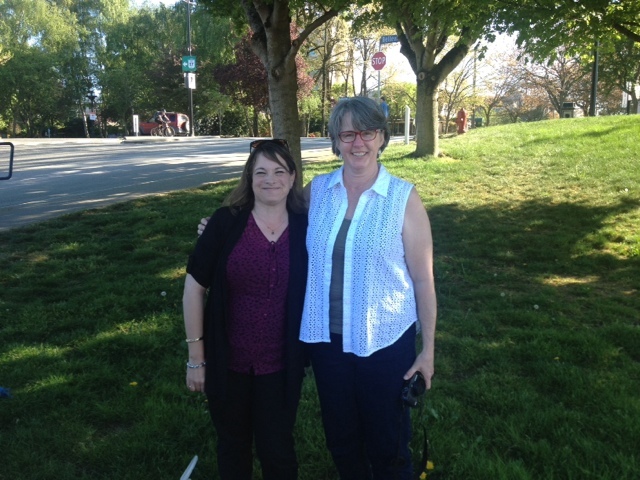 I had a serendipitous meeting with Kathy aka ToadMama last Wednesday. She was up in Washington State visiting family. 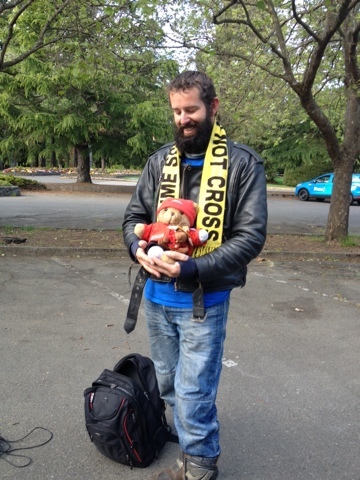 I am particularly thrilled that she came to Victoria to meet me! Unfortunately I wasn't able to get the day off, but she came anyway so we could have a bite to eat and chat. She has plenty of great adventures in Victoria and has done more sightseeing in my hometown than I have done in the 20+ years I've lived here. 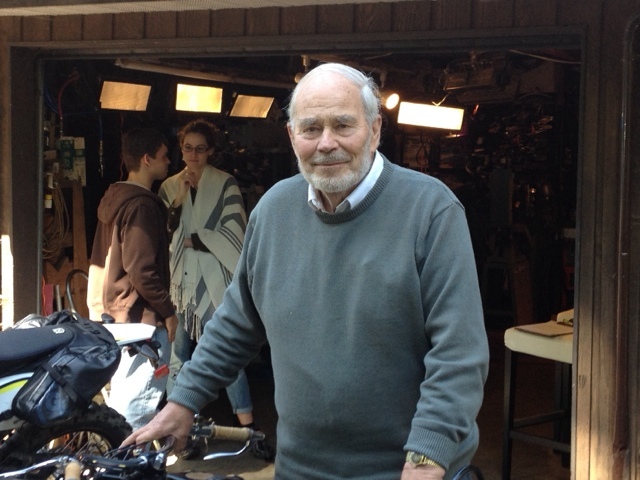 All of the motoblogger meetings I've had have been due in large part to one man; Bob Leong or BobScoot. Bob reached out to most of us who followed his blog and created a family. 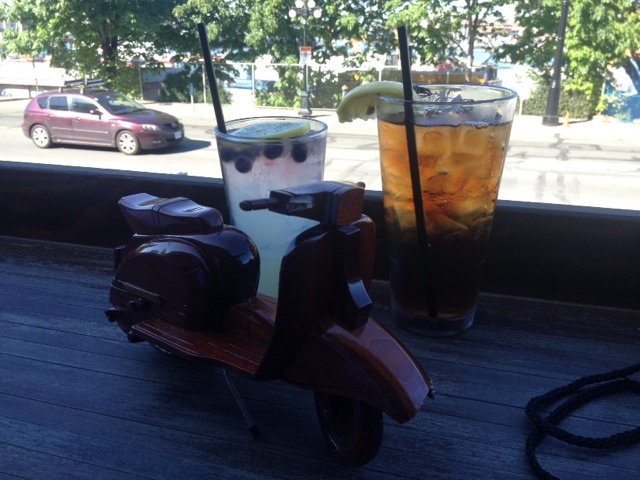 Two years ago Bob passed while away on a trip of a lifetime and left a legacy of friendship and a little wooden scooter dubbed ScooterBob. This little wooden scooter has been on an epic journey with motobloggers across the world hosting him and chronicalling their adventures. Boy was I surprised when Kathy pulled him out of a carefully packed ToadMama bag. I was gobsmacked and had to regain my composure. 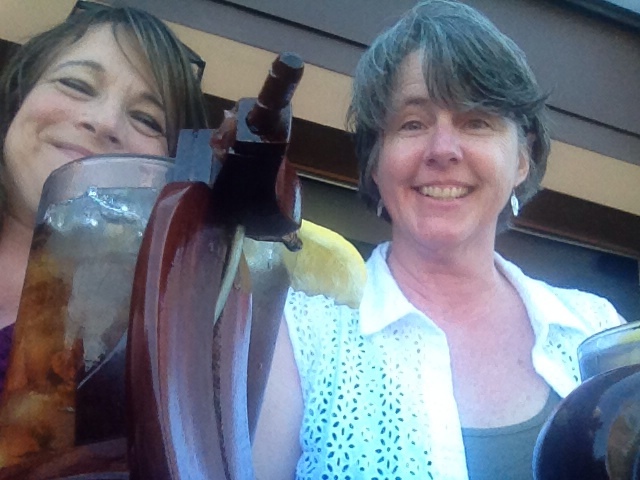 We toasted Bob's memory and enjoyed each other's company, but alas the time flew past and it was time for Kathy to catch the Clipper. It was a wonderful visit and it felt like we have known each other for forever. We exchanged little gifty mementoes. Kathy I love it! 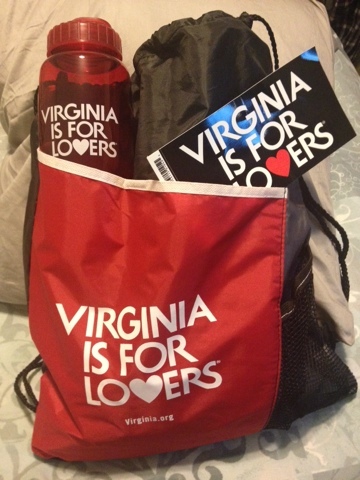 Perfect motorcycle bag & water bottle! 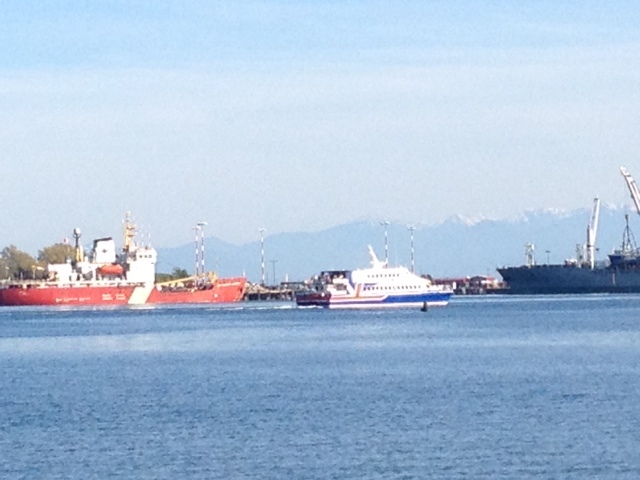 I broke land speed records to get back to Esquimalt and grab the dog to whip down to the rocks and wave farewell, I had to see her off and waved my heart out. 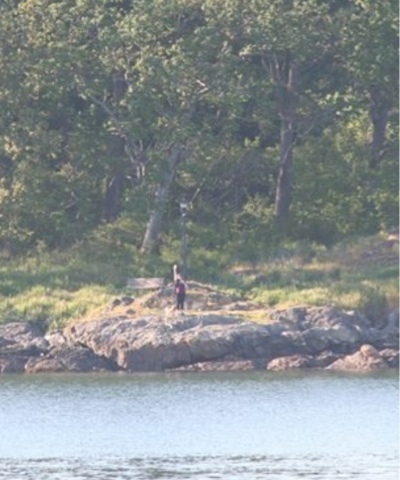 She saw us and waved back! 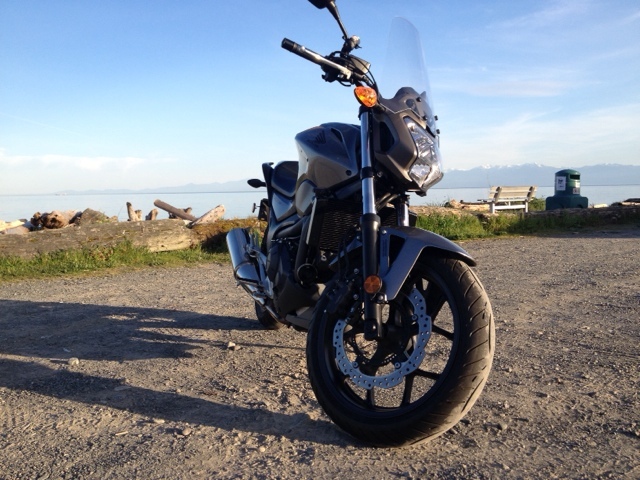 Farewell does not mean forever and I am more than hoping to get out her way on my bike sometime soon! Kathy spotted me & snapped this pic. I also have to say that BobScoot is still bringing the motoblogger community together and I know that he would be smiling and happy! Riding season technically began for me April 1st. Here in Victoria we have very mild winters and I could have ridden all winter, but I usually get wimpy come November, mostly due to rain, grey skies and reduced visibility to other drivers. It seems particularly in winter months most motorcyclists become even more invisible to car drivers. 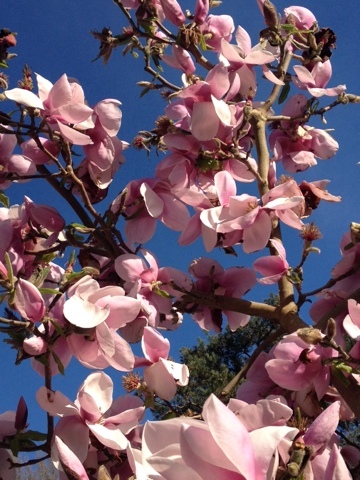 But then there is the hint of spring with blossoms and sunny skies and motorcyclists are out en masse tearing up the pavement, fighting for our place on the roads of the concrete jungle. I can almost hear a Tarzan yell in the distance, well not really, more like the sound of a car horn or the deep throaty vibrato of a motorcycle engine as it winds out down the city street. The weather has been pretty spectacular and warmer than usual, I think if this is any indication of the coming summer it is going to be long, hot, dry, and sunny. 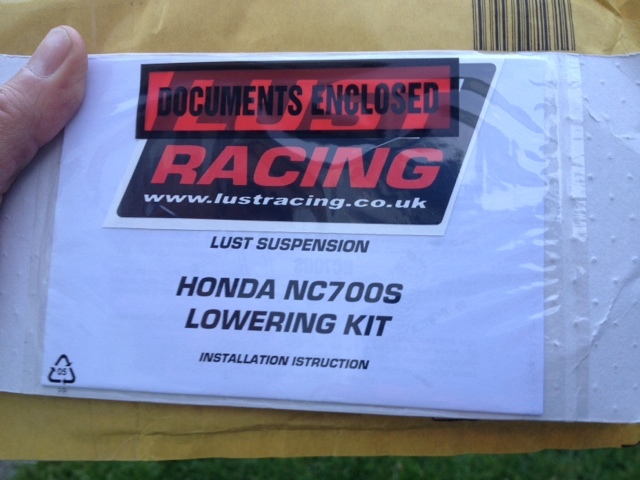 It was time to shake off the moto cobwebs and get some insurance going. Off to the local insurance company for renewal and a big ouch to the wallet. For 6 months of insurance with a safe drivers discount it's still $700 give or take - with me doing all the giving and ICBC doing the taking. 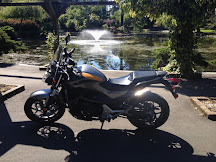 At this point it's cost me about a $150 for each ride, but then the rides have been priceless because of the moto happiness quotient every adventure brings. 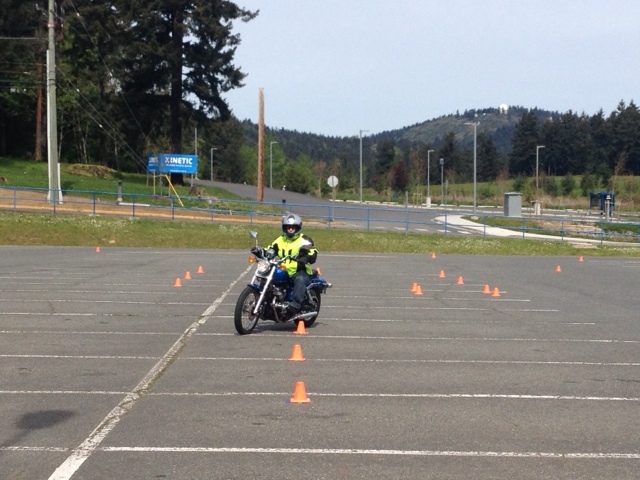 It's also the start of motorcycle teaching season. I get such a thrill introducing newbs to the passion of riding. I can't even explain the feeling of utter joy when I see the "light" come on and know that things are clicking and their skill foundation is being built brick by proverbial brick with slow speed to high speed skills. It is an amazing process to be a part of, these fledgling riders start from ground zero, many without ever having touched a bike. 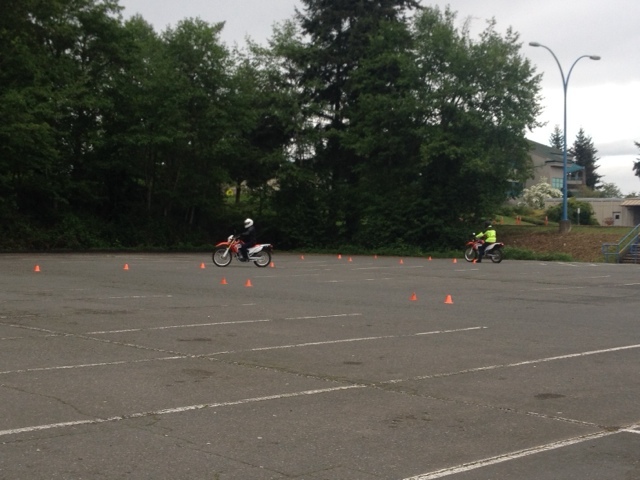 We build skills starting with them pushing each other on the bike, to learning about slow speed skills working in the friction zone and this is only in the first 60 to 90 minutes and then to finally turning the key and riding a circuit of slaloms, 90 degree turns, and the always dreaded u-turn box and that is only on day 1! 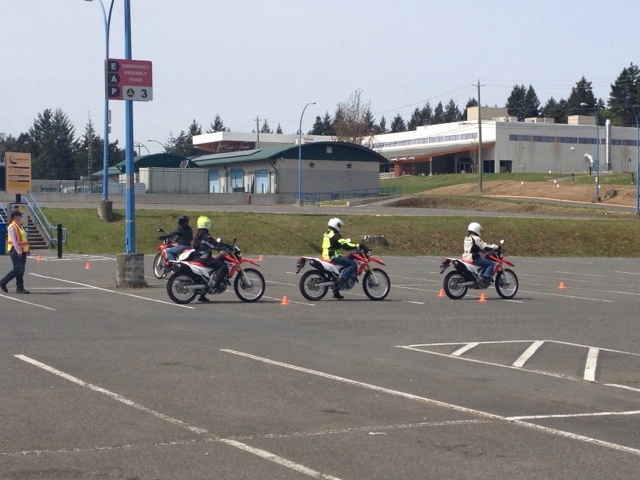 Day 2 brings the higher speed aspects of riding to the students, keeping in mind they have only been on a bike for 4 hours at this point. They are learning gear shifting and the magic of the powerband, acceleration and the all important application of braking and the blissful art of counter steering - hello future twisties! I marvel about the incredibly steep learning curve and transformation that has taken place in such a short amount of time. 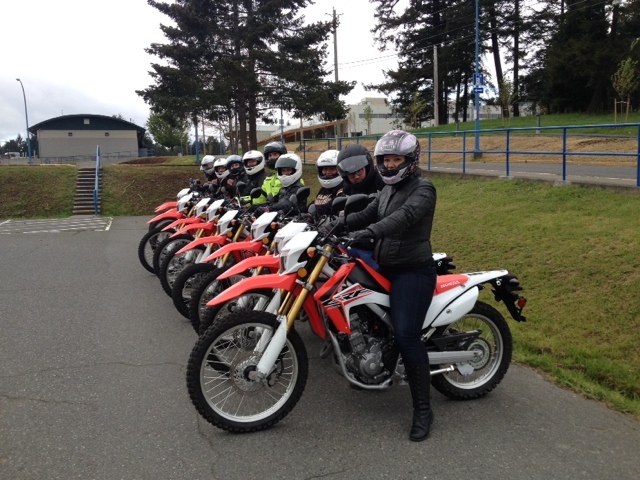 These students who a mere 4 hours into the course were tentative, nervous as hell or the very few who had more bravado than skill learned quickly that motorcycling is a demanding task master, but one that can gloriously induce a state of euphoria or can just as easily create a humbling moment no matter the skill level. 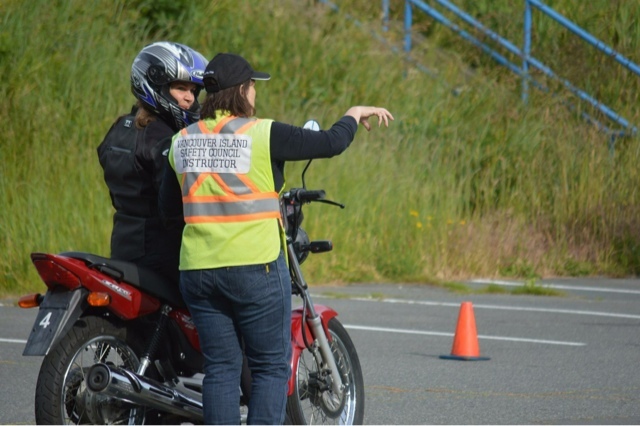 As a teacher I want to instill the joy to be found on the back of the bike, but also the responsibility that comes along with it and it is a very fine edge indeed. 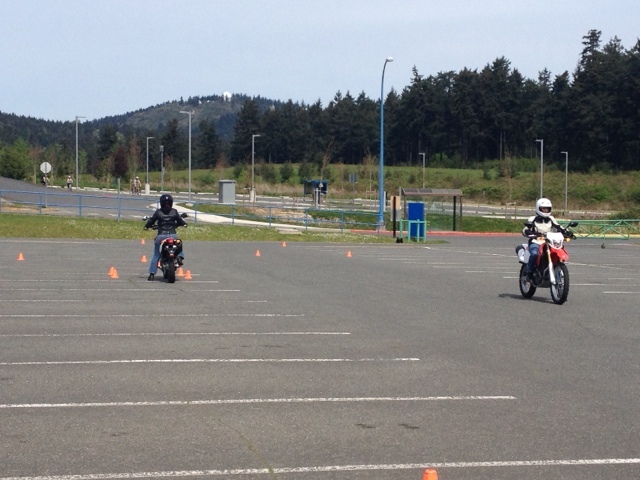 After their first full weekend of riding and doing the last high speed counter steering gate slalom exercise zipping by me in 2nd or 3rd gear is pretty miraculous. These were the students who only the day before were afraid to turn the key and twist the throttle are now all feeling like road queens and kings with the hugest of smiles. 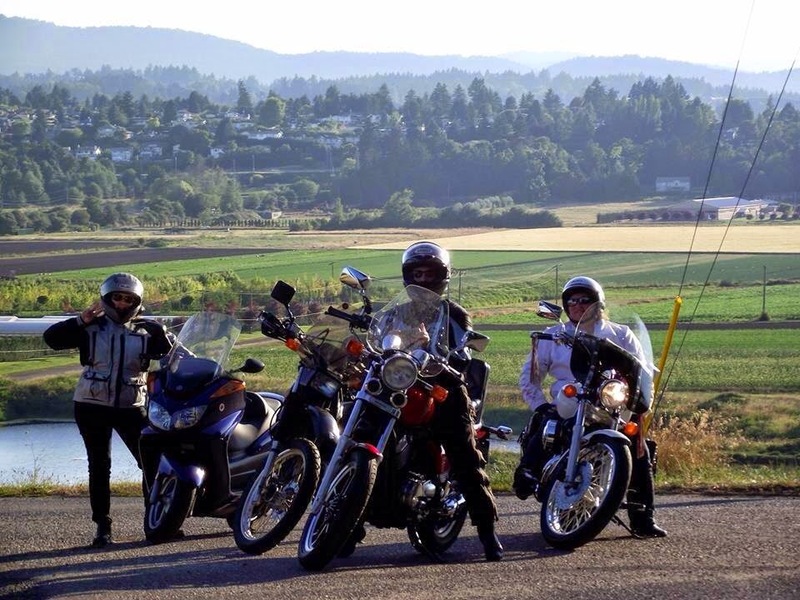 You can feel the electrical frison of excitement and happiness enveloping them with a sense of accomplishment and their first taste of the ever building passion of their riding future. I am just as euphoric and giddy as they are! My one student said to me, "I made it into 3rd gear! I was leaning and doing 39 kilometres an hour! Oh my god!" All I could think was if you think 39km/hr was great just wait! There is more much more to discover, it will be thrilling, joy inducing and maybe even a little terrifying at times, but if I have done my job right through mentoring and foundation building, they will be just fine and well equipped to deal with whatever comes their way out on the road. So is hauling 10 bikes out of a trailer, working in wet cold weather or extremely hot weather and pounding back and forth on hard pavement worth it and fun? YOU BET, I WOULDN'T HAVE IT ANY OTHER WAY! 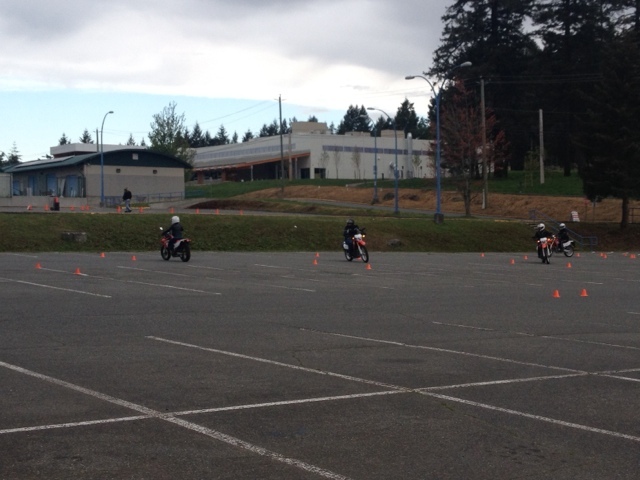 Onwards to day 3 and 4, and 10 new motorcyclist on the road! It's all about the links, no bobble. 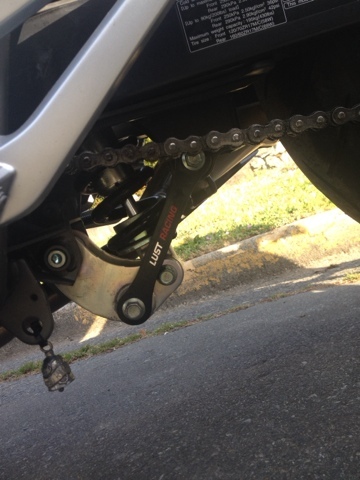 On another note I did a modification to my bike, I put lowering links on The Duchess. Since last May when I got her I have struggled with her 32 inch seat height and have been seriously questioning my purchase. 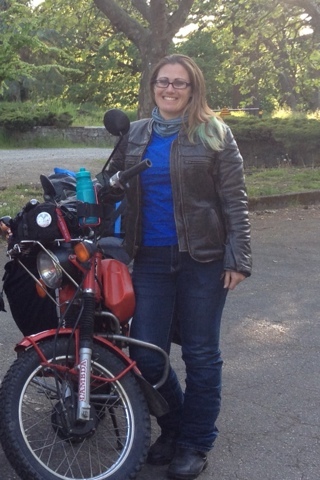 The reality for me is that I am vertically challenged which poses challenges in some riding situations and bike choices. Most bikes on the market right now are clocking in at a 32 inch seat height and it is a struggle for a lot of female riders of average height. Riding it was never the issue, but stopping on off camber road surfaces and manoeuvring into parking spaces was precarious at best. I was ballerina toeing the bike and it has resulted in some near misses with the weight/height imbalances. Just call me Tippy. 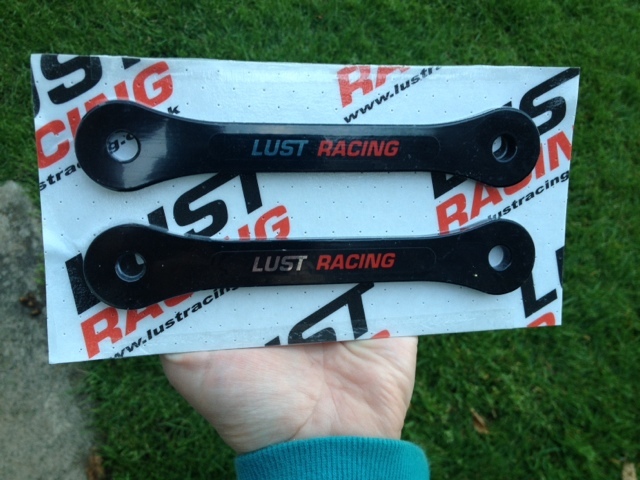 We ordered the links from UK based Lust Racing and they links lowered the bike by 1.5 inches. 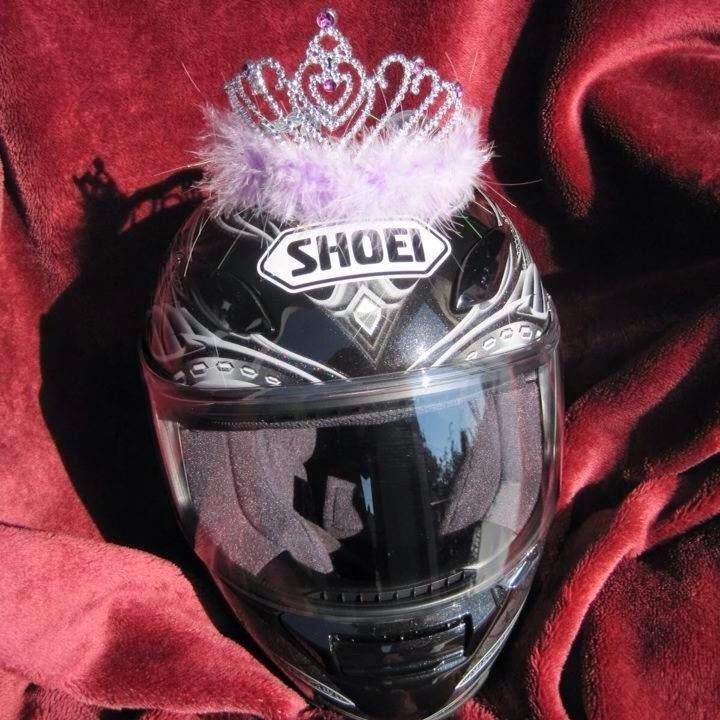 This has been the best thing I have done for me motorcycle Farkle wise. I can now get a solid left foot plant when stopping and I can get the balls of both of my feet on the ground when backing up to park. No more ballerina toeing! 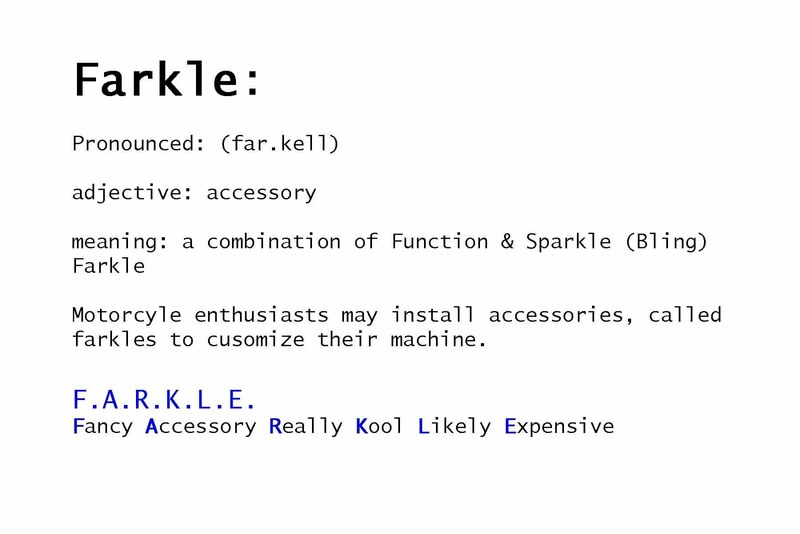 Have to say it's pretty exciting to get Farkles in the mail! 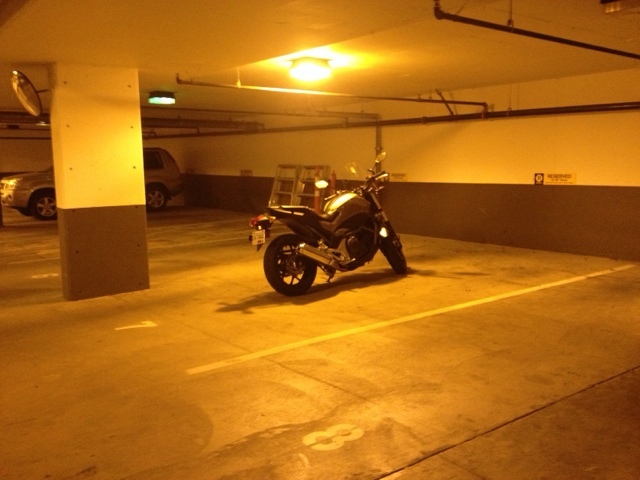 The Duchess is waiting for me in her daytime Moto lair. Today was a 'survival day' at work, technical difficulties with electronic challenges and other client needs, which meant no breaks and I worked OT. At the end of the day I was sufficiently wound up & more than a little stressed. It was a beautiful sunny day, the kind of day that you dresm of being out on the bike and carving some beautiful twisties, oh to dream. 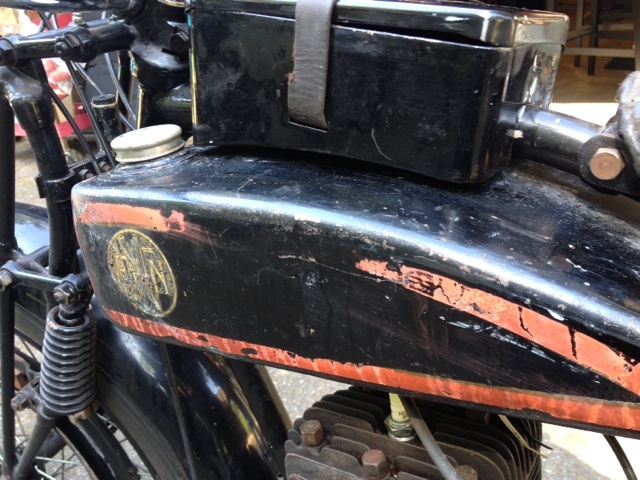 Any way after I was done I beetled down the stairs to my two wheeled love and I was gone. Of course it was in the thick of rush hour so my impatience was getting the better of me. So finally I made my way through traffic found some twisties and felt the stress draining away. I ended up in Esquimalt Lagoon, parked and sat on a bench and just relaxed. As I was riding through the rural forest part ifvthe road the smells were amazing, you could smell summer. It was the sweet tang of pine, spruce, and soil with a hint of raspberry. I love the sensory aspect of riding, I always feel so in touch with the environment. I could literally feel the stress melting away and it cleared my head space. 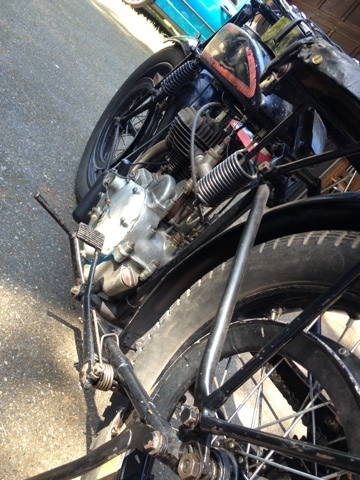 You know what they say - you never see a motorcycle parked in front of a psychiatry office, I love two wheeled therapy. Happy stress free face. All it took was about 90 minutes of moto wandering and all was right in my world. 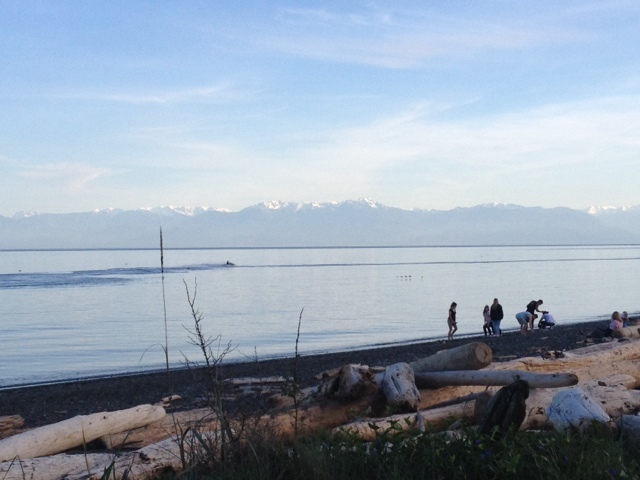 It was such a beautiful day very summer-like, so much so that people were out on jet skis. It was a good way to wrap up a dismal Monday. Here's hoping the rest of the week gets better!